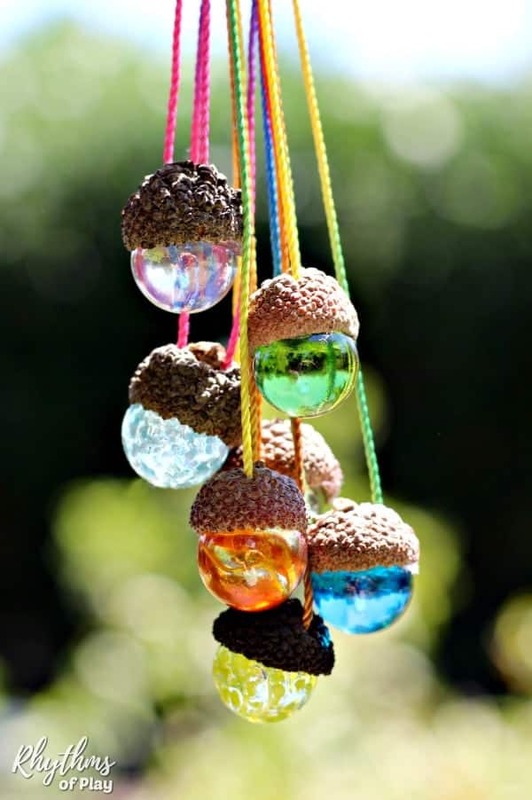 This DIY acorn marble necklace is an easy acorn craft idea for kids and adults. These gorgeous marble necklaces are made with natural acorn caps and are a homemade gift idea kids can make. 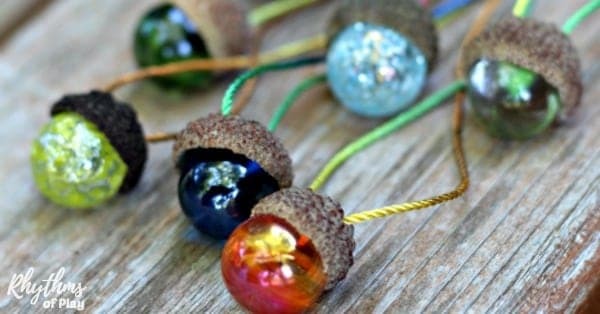 Acorn necklaces make excellent gifts and birthday party favors. Unless you have a supply of acorns and/or acorn caps on hand like we do, you will probably need to go on a nature hunt to collect them. Look around oak trees and you’ll find plenty. I have included an affiliate link to some acorn caps that should work if there are no oak tree’s growing where you live. Links to necessary supplies are also included for your convenience. Marbles; we used these, or you can try these. Step 1 – Play with the marbles and acorn caps to see which acorn caps will fit a marble to make a pendant for an acorn necklace. Not all acorn caps will work. Some will be too small while others will be too large for your average marble. Large acorn caps can be fit with a shooter marble . My husband loves his! Step 2 – Cut hemp cord for acorn necklaces. Cut hemp cord in sections 26 to 32 inches long. Cut as many sections of hemp cord as you need for the number of acorn caps and marbles that you have paired together. Step 3 – Drill acorn caps for marble necklaces. Drill two holes into each acorn cap on either side of the stem, or where the stem was. You can see daddy and daughter working below. We are raising a helper so we have our daughter help us with everything. She loves working with us! Either hold the acorn cap like my husband in the photo below or place it down on a piece of wood scrap so it won’t matter if you drill into it a bit. Please don’t forget to wear safety glasses like these two did! Step 4 – Thread the hemp cord through the holes in each acorn cap and tie the ends of the cord together to create a necklace with an acorn marble pendant. Step 5 – Glue a marble to the inside of each acorn cap. 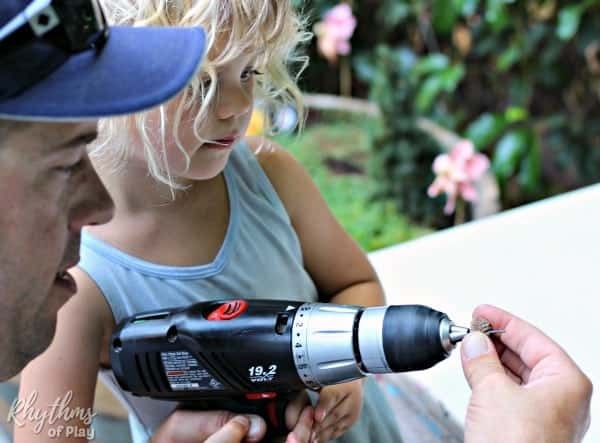 Use a glue gun to place a dollop of glue inside each acorn cap and quickly place a marble into it before the glue dries. Unfortunately, we have discovered that some marbles pop out over time when a glue gun is used. If you want to be sure that this does not happen I recommend you use E6000 Craft Adhesive. It is EXTREMELY toxic, so please follow the manufactures directions if you choose to use it. I only use it outside and allow it to dry outside without any children nearby. Safety first! 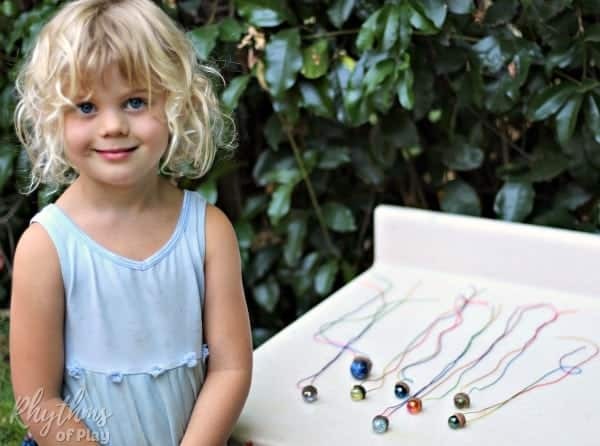 Look how proud my little girl is of the acorn marble necklaces that we made on her DIY Outdoor Art Table and Mud Kitchen. 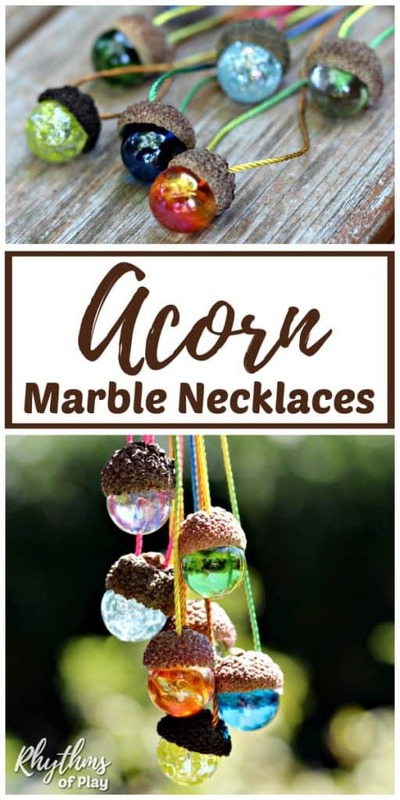 Acorn marble necklaces make wonderful party favors and gifts. They make beautiful necklaces and unique ornaments you can hang in your window or on your Christmas tree. 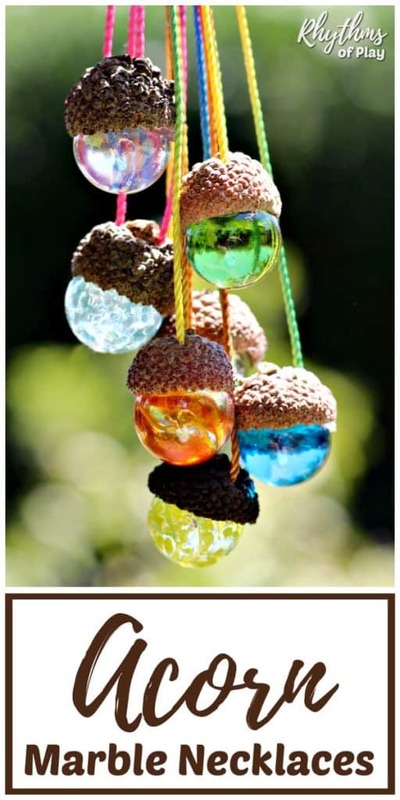 Click on the link for all the DIY details to make your own rustic acorn marble ornaments! My daughter is so enamored with her handmade acorn marble necklaces she loves to wear them and hand them out to anyone that admires them. We have turned it into a pay it forward kindness project of sorts. I was so proud of her the first time she spontaneously gave one away, I encouraged her to do it again. I told her that we have plenty and we can always make more. She happily agreed. Since then it has been a magical experience watching someone receive one. Both young and old wear them with pride. They make a gorgeous piece of handmade jewelry when worn as a necklace. They also make wonderful window decorations and are great gifts and birthday party favors too! You may also like this gorgeous collection of gifts kids can make. Learn more about Rhythms of Play HERE! So cute! Easy to make for gifts and I just love the way you got your child to learn the joy of giving! It’s been so much fun to give them away Emily! We have already made a second set! Thanks, Julia! So glad to hear you like my crafts and have decided to purchase “Green, Crafty, and Creative!” I hope you get a lot of use out of it. 🙂 Not to worry, I plan to share many more fun crafts over the next weeks, months, and years! I love the little Acorn’s there so cute. I live in Hawaii and we don’t have acorns, but I know I’ll find something else to use. Thank you for that cute idea, and I love that your daughter saw the joy of giving. Love you’re ideas. And I really enjoy doing Crafts. I also crochet, sewing . Thanks for letting me join . Thanks, Elizabeth! So glad you enjoy the ideas here 🙂 Glad to have you as a member of the Rhythms of Play community! These are adorable. I hope you don’t mind, but I shared them on my blog today along with a link back.